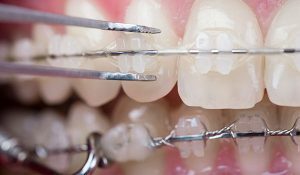 Now that you have your braces on, proper care and maintenance are important for successful treatment. If an issue should arise here are some guidelines of what is considered an emergency and what can wait for the next available appointment. In the case of a traumatic injury involving the teeth or jaws, call your family dentist. If a cemented appliance becomes dislodged, please call our office at 203-431-4466. Depending on the severity, please call 911. Loose bracket or loose band: If the bracket or band is still attached to the wire, leave it in place. If uncomfortable, cover with wax. If it comes out completely, bring it with you to the next appointment. Do not connect headgear or elastics to a loose band. Loose tie wire or elastic tie: Notify the assistant at your next appointment. Headgear or appliance does not fit: Notify the assistant at your next appointment. Soreness from braces: Rinse the mouth with warm salt water. If necessary, take the pain reliever that you would use for a headache or similar discomfort. Wire out of tube: Try to place wire back into tube with tweezers. Place wax if uncomfortable. Poking wire tie: Bend wire tie back with a spoon or pencil eraser. If unsuccessful, cover with wax. Poking arch wire: Cover with wax or wet cotton. For any of the above, please notify our office at 203-431-4466, so that we can address your needs. Prompt repairs will help ensure that treatment stays on schedule.